The recent exciting series of the Walking Dead has inspired my students to ask a lot of new zombie questions. 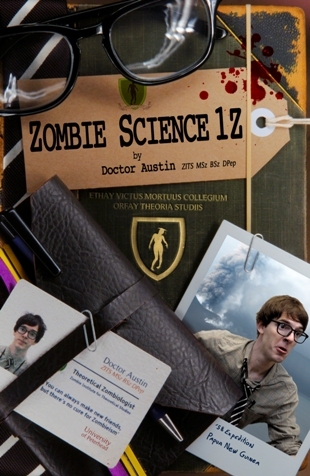 Andrew, an excellent student of mine, asked me this, ‘Are zombies able to tear into someone’s guts with their bare hands? We all know they like to use their teeth but can say Granny Z (that is a zombie with no teeth) uses its hands to tear us into swallow-able pieces? We have already seen zombies have no self-preservation instinct so assuming no atrophy or other degradation of the muscle mass should we not be conscious of the fact that zombies will bring a greater strength to bear as they will not care about injuring themselves? Something any human is capable of (imagine pre-zombie granny Z lifting a car off her grandchild) under particular circumstances’. I hope the answer is no, but I have my doubts. Let’s start with the first part, can a human being tear apart another human being bare handed? Well yes, yes they can. As recently as October 2011 a man in Italy tore out his own eyeballs during a Church sermon, and in 2006 a man in the USA lifted a 3,000 pound car to free an injured cyclist. 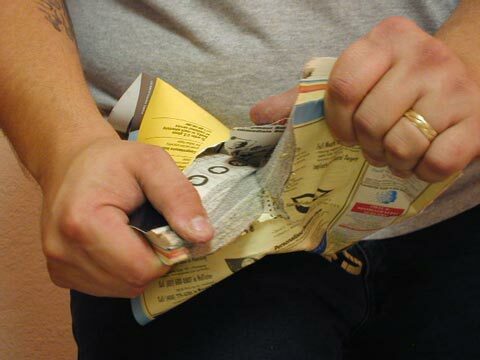 With practice most of us could tear a phone book in half, even if I myself have never managed it. Success! I can't wait to call my friends, what are there numbers? Oh. But a person suffering from our proposed Zombieism Prion Disease would be very unsteady on their feet, and have poor control over their limbs. Also, because Zombieism would be a new form of prion disease, it may incorporate the symptoms and characteristics of other current prion diseases. For example Chronic Wasting Disease (CWD), causes amongst other things, extreme weight loss. Although it affects animals at present CWD could develop into part of the new Zombieism Prion Disease. 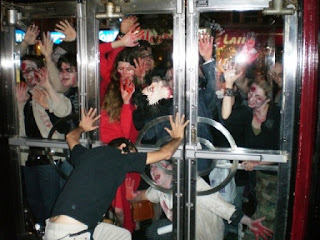 So there is a good chance Zombieism would reduce a person’s strength considerably. With regard to self-preservation amongst zombies, we certainly see that symptom in the movies, with zombies happily walking through rotor blades on the off chance of getting a snack. In our studies we have concluded that real life zombies would feel pain. The condition congenital insensitivity to pain (CIP), which prevents sufferers feeling the signal of pain, is something one is born with. It cannot be caught like a cold. This condition is the closest comparable one we’ve found to that fictional zombie symptom. CIP is very rare, with only around 100 cases in the USA, so we can bet a real zombie is very unlikely to have that symptom. No stinkin' helicopter rotor is getting between me and my brunch. However we know that Zombieism causes a lot of damage to the brain. One area of the brain, the amygdala, is responsible for our instincts. Shaped like an almond, and buried deep with the temporal lobes, it produces much of not only our instincts, but our base emotions as well. If Zombieism caused damage to this area, it may produce a zombie that was overcome with instinct, so much so it may show disregard for pain, even if it was feeling it. Finally let’s go back to those events, like Andrew’s ‘Granny lifting a car idea’, where people show moments of almost super human strength. In a dangerous situation the human body goes through some interesting changes. I'll either lift that car, or shoot it off. In the brain, the hypothalamus activates, sending a chemical signal adrenal glands. These glands produce adrenalin, which is to the human body, what spinach is to Popeye. When fuelled by adrenalin our muscles are able to contract more. This suddenly gives us the ability to perform actions, like lifting a car, actions we normally couldn’t have managed. Some believe that most of time we only use a small proportion of our strength. When under threat we simply gain the ability to expand on what we already have. But these fits of strength are short lived. Within a few minutes of happening the body begins to return to a more normal state. It’s a lot like those friends of Captain America, the Six American Warriors, who were given a less refined version of the super solider serum. It gave them Cap’s powers but only for a short time. Inevitably these newly found super powers would give out during a pivotal moment in the plot. On the bright side they do always return during final battles. To conclude; zombies do have the potential to tear a human apart. Like humans, when faced with a dangerous situation they may also receive an adrenalin rush, giving them a short burst of enhanced strength. However the Zombieism disease would be badly affecting their ability to move both legs & arms, and may be causing wasting of the body. So they may lack comparable strength to a healthy human. Ultimately zombies are like fingerprints, each one is different. And just like fingerprints they inevitably end up all over your glass door. No zombie would have the exact same presentation of the disease as another, so some may be more akin to human, and others more akin to demons. I just washed these you inconsiderate fiends! Thank you Andrew for a great question, and if any of you out there want to know anything about the real science behind zombies, do get in touch on info@zombiescience.co.uk.